I can’t believe the 4th of July is right around the corner. I don’t know where the time goes. On the 4th we are going to have a BBQ/Picnic. I found a great craft project to make to use for the day on P&Geveryday. I am going to make Easy Picnic Utensil Holders. They were fun and easy to make. 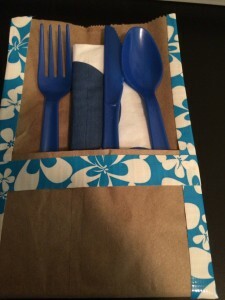 It only took a few items to make these handy Utensil Holders Paper ~ sacks (brown paper “lunch” bags), colored tape, plastic utensils and paper napkins. The first step is to take the lunch bag and place it on a hard surface and fold it up from the bottom. This is the pocket to put the utensils. Create a crisp crease. Next take a strip of colored tape and place half of it on the top edge of your folded piece, and then press down to make sure the tape adheres correctly. 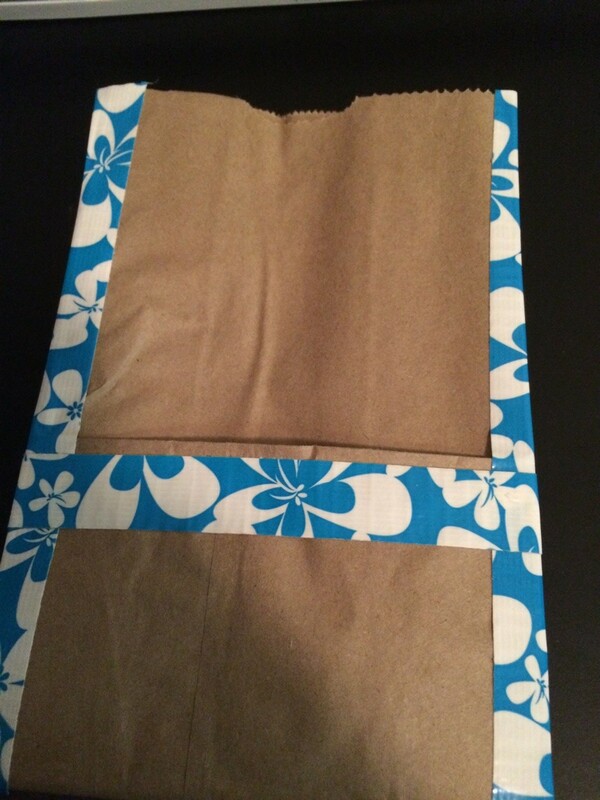 Do the same to each side of the bag. If you want to personalize the holder now would be the time to add stamps, stickers, names or phrases like “Bon Appetit” or “Eat, Drink and Be Merry”. The finial step is adding the napkin and plastic utensils. 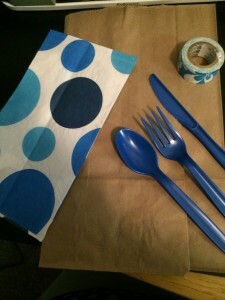 It is fun getting colored napkins and utensils to match your theme. What is really great is that you can open the bag when you are done eating and collect all your trash to throw away. So not only is it a cute idea it is practical too! I really like P&Geveryday they have all kinds of articles on the site. You will find delicious recipes, beauty trends, smart tips, DIY projects, fresh ideas, product ratings and reviews, coupons from trusted brands and much more. They have some great Quick & Easy Recipes that I love – like 4 things to do with left-over mashed potatoes and No Bake Peanut Butter Pie. There is a section on family bonding. You can find something new every day. They have great ideas for holidays too. I try to go to P&Geveryday™ a few times a week. P&Geveryday™ is about listening to what you truly need and sharing resourceful ideas, advice and products to make it easy for you to enjoy life … every day. It is your online platform created by Procter & Gamble, a company that has been establishing brands for the past 175 years. I think P&Geveryday has something for everyone. Make sure you check them out and leave me a comment on what you found that you like. Check out their P&Geveryday Facebook page for even more ideas on how to achieve a life full of rewarding moments. I love crafts like this one super cute and fun. I also love the material you used for this project. Love how cute and simple these are, great for a picnic our outdoor barbecue! Oh my goodness those are so adorable! How simple, but elegant, personal, and practical! ! I love your craftiness of this post! So simple but adorable all together in one! Thanks for sharing and when I have my next get together, this is perfect! This would work great when having a big BBQ, everyone could just grab one and go! very very cute i have no artsy or crafty sense in me to come up with something so cute! Great project ty! I think you are very artistic and creative and your finished product looks earthy and chic. I would love to do the same if we ever had picnics. Such a cute idea! Even I think I could do this, and I am not crafty in any way! Thank you for sharing! Really cute project! It’ll be perfect for an upcoming family picnic. Thanks for sharing! What a neat idea, I wish I was creative to come up with this stuff, it’s a good thing the internet has all kinds of ideas I can use like this. That is so smart! It is cute too! This is my kind of craft! Thanks for sharing! Cute! I love P&G and love their site too! What a cute idea! Thank you, I am going to make this! I have been a fan of their site for quite some time! They ALWAYS have great entertaining ideas and I have made a couple of the recipes they have posted! These would b perfect for a kids bday in theme or color. Nice! This would be nice to have for my husband to take to work with him in his lunch bucket. Better this way then the silverware just flopping around in there. I am a P&G fan. I use many P&G products on a regular basis. Thanks for introducing me to P&G Everyday. This is much nicer than the plastic tupperware I have been using. Thoughtful and inexpensive. Everything doesn’t have to cost a lot of money to be cool. This is beautiful.can’t wait to get one. Useful and cute. what I like about this idea is that it would be a great group project for kids. These are adorable… and useful for every type of event. Will for sure be doing this in the future!! Great tip! Cute idea, looks easy enough. That is such a great idea for a picnic or any meal with plastic ware. I always buy the cool/pretty tape and never know what to do with it-I’m going to wow everyone with a BBQ this month and do something similar. I love P & G and they have a lot of excellent coupons that save a ton!. That very cute and I like how nice and neat it looks. I especially like how it would store flat and this would solve the age old problem of blowing napkins and lost forks and such! This is a super neat idea!! These are really cute and would add charm to the picnic or event. Thanks for sharing what you did. What a clever idea! Guests will be impressed, youi can color theme it and love the idea of using it for litter afterwards. Thanks! So cute, and super easy! Would be a lot of fun decorating them for other holidays as well! This is so cute! Thanks for the post! I love how innovative and useful these products are! What a cute idea for a picnic!! These are so cute. They look easy enough to make. This way the wind would not blow the napkins away. Soooo cute and what a great idea to have little “trash” bags right on hand. Would love to try these for my little guy’s birthday next year! This is a great idea. 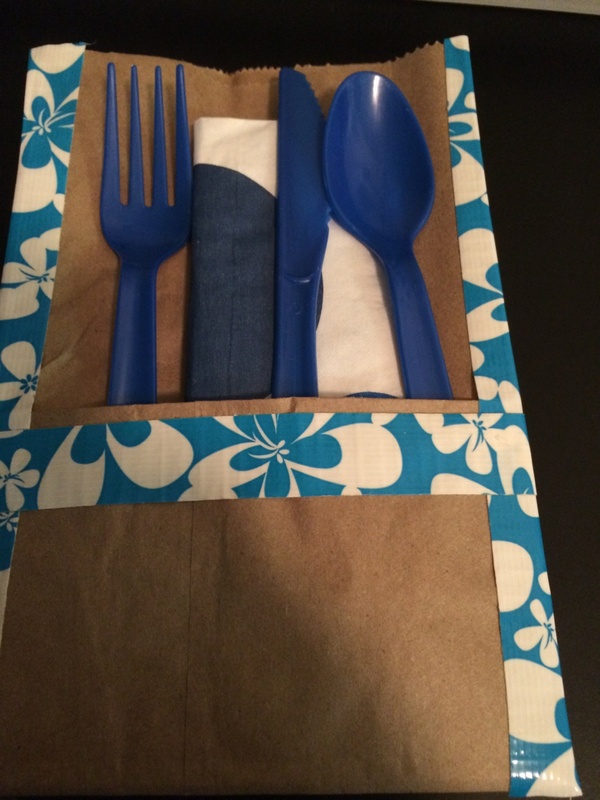 A way to dress up disposable silverware and napkins. I’ve had parties that I wanted to look nice and so I used real silverware and after I’m up late washing dishes. Or I used the disposables and had to accept that it didn’t look great. This would be a cute way to compromise. What a cute idea and so easy! Thanks for sharing. I love all the cute designs that are available now on disposable items, they use to be white or white! Those paper bag utensil holders have been all over pinterest lately! No wonder – they are wicked cute! What a great idea! I like that they are so cute and yet they can be used as bags for the trash also. I love this idea thanks for sharing and showing how it turns out. The possibilities are endless for this. This is a really neat craft and thank you for sharing with us. Great idea! Super cute, and I love that they can be used for clean up too! Very practical and fun way to make useful household items! Thanks! My 1st visit here and those are so cute! Very cute ideas! Love the colors! These are super-cute! I love that they can be customized for different themes and colors. I’ll try them out for an upcoming picnic party we are having! Great idea for picnics or when i take my 5 yr old niece to park!!! these would be awesome for kids parties too. that’s such a cute idea and so functional! This is so cute love it for my next BBQ the kids would find it fun to make them too. So cute. These could be stylized for just about any occasion, too. I could see them at a child’s birthday party, or a baby or bridal shower. I love getting the P&G newsletter. They have some great ideas (and I especially love the coupons). What a wonderful idea for a picnic!!! What a sweet picnic holder for silver ware – P & G Everyday looks to be a useful site for DIY and other houseful shortcuts. Great idea encourages the trash disposal is a snap. What a great idea! And I think i might actually be able to do this one. Wish there was a pin it button. Very cute, wonderful idea. I’ll probably end up trying to do something like it! I love to enter contests, but I find that a lot of these contest require me to do things I just DON’T DO…. Like I’m asked to TWEET something and I DON”T Tweet… Or Instagram… or Blog…. Infact I VERY RARELY even go on Facebook…. I love it! So easy to make, and I have so many different washi tapes! 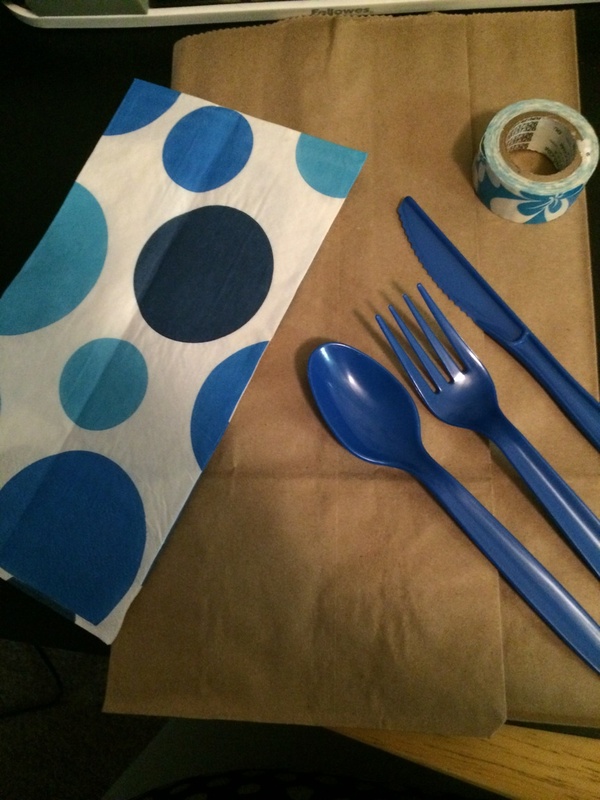 I love how easy it is to pack the utensils up for a picnic! I will definitely make these. This is so handy & I can think of 5 or 6 ways I can use this with different themes. That is just the cutest idea I have seen in a long time. My children are all grown so I don’t do picnics much anymore, but I do. Thanks so much for the heads up! I never realized how many brands are under the Proctor & Gamble ‘umbrella’. I never knew they also have an Arts & Crafts section too, though I am not surprised, now all I have to do is go visit their site! Thi is really really cute! Such a great dual duty craft that looks great and is functional! This is a neat idea. That would be something to teahc little kids to do in maybe a Sunday School class. This is perfect for an upcoming family reunion picnic. Thanks for sharing! I like the colors. That is so easy to make. These are so pretty and look easy to make. They’re great. This idea is perfect my daughter wants to have an outside party right before school starts and these are so cool all her little friends will love helping to make these. What a great idea! Simple yet so very useful. I will be trying this at our next bbq. Thank you! This is an awesome craft to do and a perfect way to recycle too, love it!!! thanks for sharing!! How creative! I love that these are stylish, disposable, and can turn a picnic into a formal event in no time. Very nice and cost effective! This is a very cute DIY way to spruce up the picnic table for the summer holiday! Little bursts of color like this make candid family photos even better! This is adorable! and a great thing to do with the kiddos! I love the color coordination! That is one of the cutest and most practical things I’ve ever seen! I missed the 4th but there is always Labor Day to use your idea (if I may! ), thanks! What a adorable idea! It is functional and festive! Thank you for the great idea! Fantastic idea, love the tape. Perfect for picnics and barbecuing. Cute idea. I love cheap usable crafts. This is a get idea to do for a inside picnic in the winter also. These seam to be kind of easy to make. Could have fun doing more crafts. Very cute and stylish looking, my kids would enjoy making these! These are cute items. They would work great for my picnics. I love this site! Thank you for sharing it! This is a great idea! Thanks so much! This is such an adorable idea! I love that it is so easy and practical at the same time! I will definitely keep this in mind the next time we throw a party or have a BBQ this summer! Those are adorable! I always think I’ll do something fun with tape, and I never actually do it… I’m inspired! This is a cute idea. I have never looked around the P&G website but I might start now. Thank you for sharing this idea. What a very crafty idea. Love the blue colors. This is adorable. Be really cute for a family reunion picnic or a grad party picnic! I love this idea. We will be having a mini luau for my daughters upcoming birthday and we will be making these to match her theme. Thank you so much for the great idea. that’s a really neat and practical craft….I will have to try to remember it for future get-togethers. Really cute idea! I especially love that the bags can be used to collect the trash/dirty utensils afterwards. Very cute idea, I never think of things like this on my own! I like this. Great for adding that little personal touch to a lunch, dinner or cookout. A very cute idea and it can be personalized for each member of the group! What an adorable idea! I’m definitely doing this for my next bbq! That is really cute and a great ideal! what a cute idea for family picnics. This craft project looks very fun. Thanks for sharing! What an absolutely wonderful idea, and so useful! I don’t have a creative bone in my body, so I appreciate those who do.